The fishery was founded in 2005. Since the very beginning, its host has focused on stocking and water protection. In the very first days, he launched a full-time fishing guards fighting against poachers, so common a problem on Polish waters. Thanks to these measures, today one may count on frequent fish catch in the Small Vistula, while coming across a fat brown trout is nothing special. 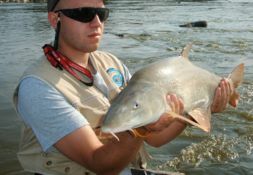 The Vistula is one of the rivers exceeding the national average as far as its fish count is concerned. The fishery is about 30 km long so there are plenty of interesting places along its banks. Shoots are typical in the Vistula. The best period for trips to the river is the end of winter and spring. 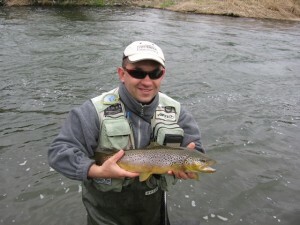 In this time, with higher waters, it is easier to mislead the brown trout. In late spring and summer, the water level is low, which makes it more difficult (but not totally impossible) to catch the trout. An additional disadvantage of warm seasons over the Vistula are bathing people who startle careful fish. 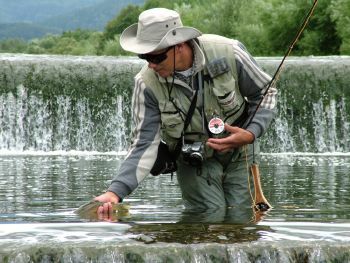 If you want to try fly fishing and catch the brave brown trout, this is one of the best places in Poland. I have been fishing for over 20 years. I started with a bob like the majority of anglers. I quickly got interested in catching preying fish with artificial bait. I’ve been spinning for 16 years, and I’ve been fly fishing for 12 years. The main goal of my fishing trips, both with the spinning and with the fly, is the salmon family. In summer, I love to flounder in lowland rivers to look for the barbell, the chub or the catfish. 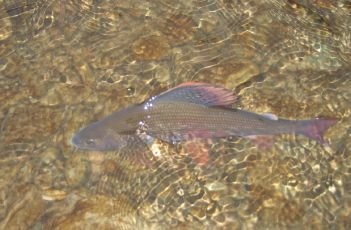 My favorite fisheries are reefs, a substitute for fishing in the mountain rivers.